Welcome to The Beachmont, a historic, ocean-view retreat in Quidnet with beach access. Step back in time to an early 1900s estate, newly renovated with an eye toward preserving Nantucket’s old-world charms. In classic Nantucket style, comfort meets luxury here at The Beachmont—which features six bedrooms, five baths, three living spaces and one exceptional open-concept kitchen and dining area. The Beachmont is an ideal option for two or three families (or other groups of up to 10) to gather at the edge of the water. Outdoors, lush gardens showcase fragrant hydrangea bushes and sweeping lawns give way to a private path to the beach. Relax and unwind on two expansive decks and take in an impressive, ever-changing view of Sesachacha Pond and the Atlantic Ocean. With two spacious living areas, a water-view sunroom, and two decks, The Beachmont provides a gracious setting for leisure and entertaining. Settle onto the crisp white furniture in the main, formal living area and chat by the wood-burning fireplace. Or kick back in the second living area to watch the flat screen TV. In the sunroom, walls of windows and vaulted wood ceilings create a bright and inviting space. Come together on the cushioned wicker sofa, curl up in the armchair with a fresh summer read, or perch at the breakfast table with a cup of morning coffee. Every seat in the room offers views of the Sesachacha Pond—spectacular at sunset. Once the sun sinks below the horizon, head downstairs to the lower-level game room with a ping pong table. Exposed wood beams, white paneled ceilings, and a classic farmhouse sink lend country charm in the kitchen, where stocked cabinets and stainless steel appliances entice you to dine in. Prepare home-cooked meals on generously sized soapstone counters, best served at a nearby table for eight. The center island bar seats four more. On warm summer evenings, fire up the grill on your ocean-view deck, and dine al fresco at the 10-person table. At night, drift to sleep in three sumptuous suites and three guest rooms, including two king-size masters and one queen-size guest suite. Each suite features its own bath, a private sitting area, and commanding views of the ocean. On the upper level, find the three guest bedrooms. One room has two twin-size beds, and two have one twin in each. Next door, the full bathroom is ideal for getting ready in the morning. 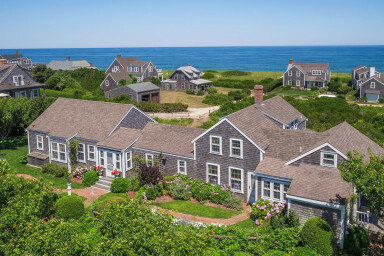 Come relax at this sprawling seaside estate along Nantucket’s eastern shores, where sandy beaches are steps away, ocean views abound, and memories linger like the sun on a long summer day.